​An authoritative source for Western gun laws. 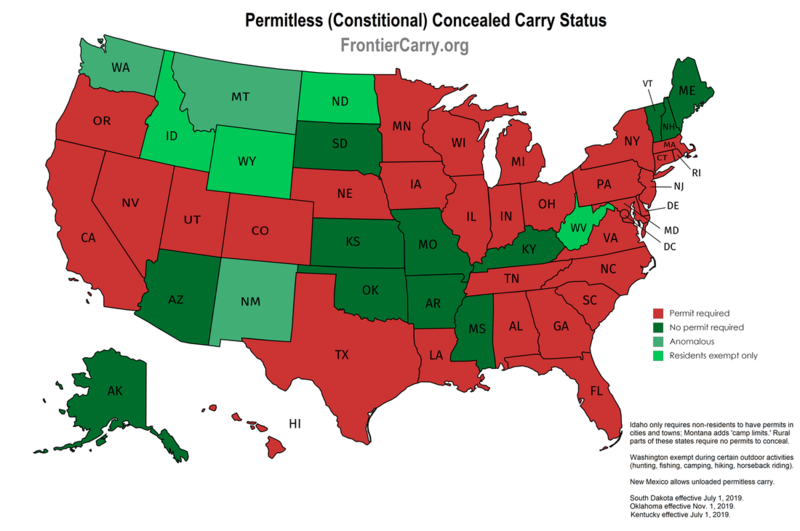 Frontier Carry is the authoritative source for the western frontier states' gun laws. These states are united by their unique history, common interests, a patriotic and individualistic culture, and strong support of the Second Amendment. We are dedicated to supporting gun rights and is operated by a normal guy with a day job who happens to be a former law enforcement officer. We are unincorporated and give our time for what we believe in. We are not a lobbyist group and advocate on a personal basis only. Our blog is part of the new media, reporting what isn't seen in the mainstream media and willing to advocate for what we believe in and report. Frontier ​Carry proudly supports law enforcement yet encourages government accountability, loves our constitutional rights, and is fiercely patriotic. We strongly disapprove of any "sovereign citizen" movement which advocates violence against police, a non-democratic overthrow of the government, or any other assorted tin-foil hat paranoia. Learn the law and be confident of your rights. The best way to defend a right is with knowledge and spreading it to others. From neighbors apprehensive of firearms to a shrill anti-gunner in the supermarket. For too long, knowledge over gun laws has been spread through word of mouth, creating a large body of myths, rumors, and incorrect assumptions. A lack of proper knowledge can lead to citizens choosing not to exercise their rights or they might find themselves in situations they could have easily avoided had they been properly educated. Aren't police the best people to ask about the law? Police aren't the best source of knowledge about the law. They are generalists, taught basic principles and familiar with common violations. They are trained to lookup laws they are not familiar with, but as humans, they often may be overconfident in their knowledge and wrong. Occasionally, unscrupulous officers will take advantage of a citizen who is not confident in their right to carry and so threaten or cajole the citizen. As we politely demand our police know and respect our peaceful exercise of our right to keep and bear arms, we must also politely educate police, our elected and appointed officials, and our fellow citizens. ​Our goal is to help law-abiding citizens understand the often confusing, obscure, and misunderstood firearm possession, purchase, carry, and self-defense laws of the Intermountain West. We seeks to dispel rumors and put an end to pernicious gun law and self-defense myths that discourage citizens from protecting themselves. Through education and awareness, correct knowledge can be spread among citizens to shine a light upon areas of common contention between citizens, their government, and local authorities who are often in conflict over Second Amendment rights. By banding together, states with a common heritage, common interests, and inter-mobile populations can share best practices, ideas, and knowledge to achieve these purposes. Together, with a central share point of law, history, news, and information, state and local gun-rights groups and citizens can effect greater change and cooperation on a regional basis. From our mountains, to our deserts, plains, and canyons, the rugged states of the 'Wild West' still have a unique perspective and unique considerations when it comes to gun rights. Though the various states have diverged paths over the years, all have a common legal and western history. The cowboys, loggers, miners, prospectors, pioneers, trappers, and hardy souls that founded these western lands all understood that in the west, individuality and self-protection are supreme. This identity is alive and well, but under increasing threats. From the new front of the Sagebrush Rebellion against burdensome federal influence, to an influx of voters exporting progressive, statist values contrary to the long-established mindset of the West, and a concerted effort by private individuals, groups, and would-be tyrants to restrict gun rights, each state is in danger of falling prey to the anti-gun movement. Since the 1990s and especially since 2013, American opinion has dramatically shifted to re-affirm the importance of the right to bear arms. Sadly, mass media and wealthy, liberal individuals, such as former New York Mayor Michael Bloomberg, have made the west their own next frontier of gun control. California, once the crowning jewel of America, has long-ago succumbed to the death of individual freedoms and gun-rights. Colorado has almost nearly succumbed, but freedom lovers have mounted a good fight to turn the tide. Washington and Oregon, already descending bit by bit, are under attack, while deceptive popular measures have taken aim at Nevada and Arizona. These relatively sparsely populated states must form together as one to win against the divide and conquer strategy now being used against us all. United, we can form a formidable weapon against the never-ending crusade of evil and oppression. Self-defense firearms are generally prohibited on base. New DoD guidelines have been published, but implementation is unknown. Almost uniformly, civilians may not possess firearms on base. Service-members may be required to store their weapons as their commanding officer directs. Check individual base and service branch regulations. Additionally, army regulations are here and the oft-mentioned Bush-era directive is here (reaffirmed in 2011). National Forest lands do not ban firearms. Bureau of Land Management (BLM) lands prohibit firearms at San Pedro Riparian Zone (Arizona), Wallace Conservation Forest (Idaho), and Red Rock National Conservation Area (Nevada). Deplorables Snowflake Removal Service--Click the image to buy today! Hey! Why don't you have other states? The focus of this site is the Intermountain West, plus Washington. Why don't you check out www.handgunlaw.us?